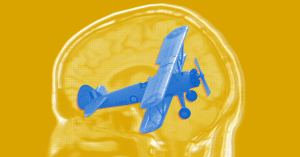 Brain activity in the lab was very different from activity while in a real plane. Stick ‘em in an MRI, have them do something, and then see what happens in their brain. It’s how a lot of neuroscience research is done, and for the most part it’s served us pretty well. But new research suggests these experiments, all set in a laboratory due to the size of MRI machines, are giving us an inaccurate view of how the brain works in the real world, especially when that brain’s person is under stress. Scanning airline pilots’ brains for signs of fatigue or sensory overload could help prevent horrific accidents, suggests research recently published in the journal Frontiers in Human Neuroscience. But more importantly, the researchers found that pilots made more mistakes (and their brains worked harder) when they were asked to perform a difficult memory task while flying a plane straight and true than when they were merely in a flight simulation. Given that it’s far more common to see a brain-imaging study in a lab or simulated environment than the real deal, we may have a distorted view of how the brain responds to stress or other real-world influences that could be diminished in a low-stakes laboratory simulation. In this case, the experimenters had one group of pilots undergo a memory test while flying a real plane and another group take the test in an immersive flight simulator. Both groups of pilots had to remember then relay clusters of messages similar to those that would have been sent by air traffic control. As long as the messages were simple and sparse enough, both groups of pilots did just fine. But once the messages reached the point that people needed to truly focus in order to remember them all, the pilots who were, you know, also trying to control a gigantic hunk of metal flying half a mile above the ground, had a steeper drop in performance than those who were just playing a video game. Both groups of pilots were also wearing a headband that recorded activity from the front of their brain using a technology called Functional Near-Infrared Spectroscopy, which can be used to get an idea of what’s going on in someone’s head without stuffing them into an MRI. The pilots in actual planes had notably-increased activity in their anterior prefrontal cortex — a brain region responsible for selective focus and memory — over those in the simulation, indicating they had to focus harder in order to try and remember air traffic control’s messages. These findings may not be too surprising: Of course flying a plane is more stressful than a flight simulator, right? But that doesn’t change the fact that practically no one is studying how the brain’s behavior changes under these conditions. Just like pharmaceutical researchers often struggle to show that a cancer drug that excelled in mouse studies will work on humans, it may be time for neuroscientists to shift their focus and see if their research holds up in the real world.